The Smackdown. Two motion pictures share a similar theme. Both have a pair of geriatric geezers (one white, one black) undertaking adventure in the twilight of their lives. Both films are entertaining, but can the big budget, major studio offering with an "A List" cast and a big name director trump a small, independently-made gem based on a Bram Stoker Award nominated short story? 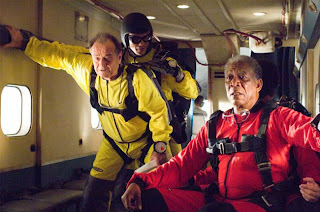 Can Jack Nicholson and Morgan Freeman best Bruce Campbell and Ossie Davis? Is gallimaufry globetrotting more poignant than fighting giant roaches in Nacogdoches? Will the Hollywood-based screenwriter from NYU's film school hold his own against the Mojo Storyteller from the Big Thicket in East Texas? In short, will "The Bucket List" command as fervent and as loyal a following as "Bubba Ho-Tep?" Fruit of the Loom jumpsuits and a Maxwell parachute -- "Good to the last drop!" What's next? The Challenger. "The Bucket List" stars two of the biggest, most well-respected actors of our time. Nicholson plays Edward Cole, an enormously wealthy, crotchety cancer patient whose hospital roommate is Carter Chambers (portrayed by Freeman), a middle-class auto mechanic with a big family, a longtime marriage and a penchant for "Jeopardy." He, too, has only six or so months to live. Together they concoct a list of things to do before "they kick the bucket," and thanks to Cole's financial capability the sky's the limit, literally, as they jet their way to the French Riviera, the Serengeti, the Pyramids, the Taj Mahal, the great Wall of China and on to Tibet. AARP would be proud. Yes, it's a wonderful, albeit, brief life they live, to the fullest, with a lesson or two being learned along the way. There's no question that Screenwriter Justin Zackham pitched a terrific premise for Rob Reiner to direct. And Nicholson and Freeman undoubtedly make the most talented "odd couple" ever. Clearly "The Bucket List" seems to have everything in place to make it a box office hit. To save money, the patients at the Mud Creek Convalescent Home are provided Maxwell House coffee instead of Starbucks. The Champion. "Bubba Ho-Tep" opens with three sentences of voice-over that rank among the most outrageous, audacious and bodacious lines in the history of American cinema. And that's just the beginning of a wildly imaginative tale concocted by Joe R. Lansdale and adapated to the screen by writer/director Don Coscarelli that proposes Elvis Presley is now a 68 year old resident of an East Texas nursing home. Of course, no one believes that he is the real deal despite the remarkable resemblance (portrayed brilliantly by Bruce Campbell) and his unrelenting insistence that he swapped lives with an Elvis impersonator so he could escape the hassles of unprecedented fame. I said no one believes him; that's not entirely true. 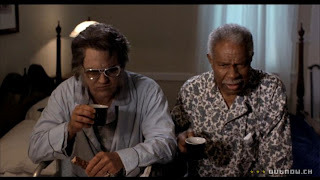 One old codger (played by the late, great Ossie Davis) does accept Elvis' story as true. Then again, this man believes he's none other than John Fitzgerald Kennedy and his now-black skin is just another example of the Johnson Administration's evil ingenuity. What a pair -- and so the stage is set for the King of Rock and Roll and the King of Camelot to undertake the greatest challenge of their lives. You see, residents of this nondescript convalescent center are dying at an alarming rate and the culprit isn't Old Man Time. Rather, it is a soul-sucking Egyptian mummy who just happens to be in the area thanks to a nearby highway accident. And while the mummified soul sucker's roaches are no match for a swift bedpan, he's the real deal as two full body burns will attest. The Scorecard. Surprisingly, "The Bucket List" borders on being a Hope-Crosby "Road" picture replete with some rather cheesy stock footage backgrounds reminiscent of "The Road to Zanzibar." Despite various technical glitches, Nicholson and Freeman do an admirable job of keeping the viewer entertained in what could have been called "The Road to Cremation." That's star power...but it is star power engulfed in a black hole thanks to the disappointing screenplay by Justin Zackham. Purportedly written in a mere two weeks, it is readily apparent that, despite the best of intentions, Zackham needed not only more time, but more inspiration and another Big Chief Notebook Tablet or two. On the other hand, "Bubba Ho-Tep" works on every level -- it is touching, it is convincingly acted, it is extremely entertaining, it is thought-provoking and it succeeds because it treats its outrageous premise with total sincerity. Let me emphasize that it is also very well written. The Decision. "Bucket" or "Bubba?" "Bubba Ho-Tep" is a triumph of the human spirit. Coscarelli has an uncanny way of making us really care for Lansdale's cooped-up old coots living their last days in ignominity. Unfortunately, "The Bucket List" fails to do the same. Ironically, one of the items on "The Bucket List" is to "witness something truly majestic." When comparing these two feature films, it is "Bubba," not "Bucket," that comes closest to that goal. Certainly an accurate and clear analysis of the two. The freshness that Bubba HO-TEP presented was a big plus and having seen them both, I nod to HO-TEP as the winner as well. I did prefer the scenery in The Bucket over that of the HO-TEP and I am big Freeman fan and loved his portrayal. Well Done!